Under Simons’ watch CCSEP successfully fought off encroachments such as oil fields, an airport, a convention center, condominiums and numerous other construction efforts that would have chipped away masses of the park. At about 550 acres, Elysian Park is unique in offering a real experience of the outdoors to hundreds of thousands of hikers, soccer players, bird-watchers, picnic-ers, wanderers, dogs and the occasional horse. In its present, hard-won form, the park offers solitude, community and beauty to the entire surrounding area. Simons’ most significant loss was in a battle to halt the expansion of the police academy. 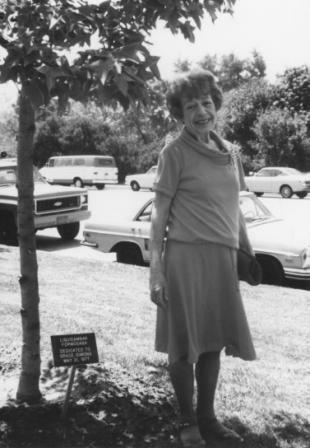 Like an earlier neighborhood progressive, Estelle Lawton Lindsay, Simons worked as a journalist before devoting herself full-time to political activities. Raised in Chicago, she traveled to Shanghai, where she worked for a French news agency, and where she also met her husband, Frank Glass, who was an organizer for the Communist Party. She also worked in New York. Simons and Glass moved to Los Angeles in 1939, and for a time Simons worked as an editor and reporter for the California Eagle, the city’s famous African-American newspaper. Simons and Glass moved to Los Angeles in 1939, and for a time Simons worked as an editor and reporter for the California Eagle, the city’s famous African-American newspaper. Simons is said to have won the respect, and ultimately the friendship, of Malcolm X, who was impressed by Simons’ sharp questioning of him concerning his attitude toward women’s rights, during an interview for the Eagle. According to Abie Robinson, Simons’ colleague at the Eagle: In the midst of a press conference Malcolm X held on the periphery of the 1963 peace march in Washington, D.C., Malcolm X reportedly pointed to Simons’ and said she was the best journalist he knew. In Echo Park, Simons and Glass settled on Morton Avenue. In 1965, Simons and a group of neighborhood residents and supporters from across the city banded together to fight a city plan to build a giant convention center in the park near the intersection of Scott Avenue and Stadium Way. That group became the Citizens Committee to Save Elysian Park. As one of the founders of the committee, Simons spent the last twenty years of her life devoted to preserving Elysian Park. Simons died in 1985 at the age of 84; her husband died in 1987. But Simons’ achievements have a way of extending themselves: A monument to Simons and Glass designed by ceramicist and sculptor Peter Shire, is a significant feature of the landscape. Simons also helped foster the spirit that led Echo Park neighbors to fight for preservation of walkers-only zoning for park trails, which are heavily used by local residents, not to mention the major effort of fighting off a proposed football stadium in the 1990s. The lodge that is named for Simons is the location of an annual event that helps to bind the neighborhood and raises funds to help preserve an asset to the entire city. She inspired others to follow in her footsteps. In a city notorious for its lack of public green space, Elysian Park stands as a monument to the far-sighted efforts of Simon and others who have fought to preserve it.